Bad sign for this super talent. I think Clemsons gonna be the team to beat this season. Any of you guys got any recomendations? Yes we need to find someplace so ZZ can join in, let me see what I can find for us. I'm gonna make a yahoo account for the college pick'em,whens the deadline? Nice to see Oregon back in the top 25. Well, the kid had a similar injury in high school. I mean 2 years back Kam Pettway at AU started the season as a former 3* recruit and was fighting for the lead in the "H-back" hybrid fb/te role...wound up getting a shot at rb due to injuries and led the league in rushing! Just a hard position to judge after injuries,UGA has plenty of talent back there though! Looks like there are 6 of us in it this year. I don't remember, but apparently I finished 2nd last year. Then you will have no problem finishing 2nd this year behind me! Excellent!!! Like you said we have room for two more. Unfortunately the College Pick'em message board is a no go, you can't reply to messages directly as ZZ said. 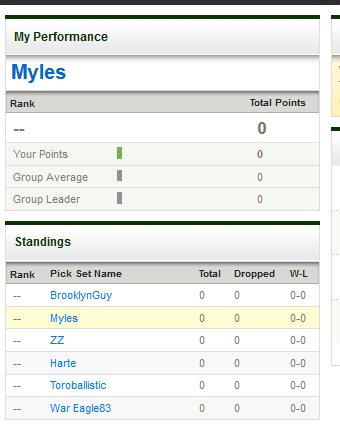 @Myles is it the same with the NFL Pick'em? Well hell, we can't have that now can we! Most certainly not!...it's in the Rualz! I'd really like to see Kiffin and the Owls give the Sooners a run for their money but it's going to be tough to do playing in Norman. Is Lane going to be L7Us next head coach?